The Finnish Meteorological Institute (FMI) has developed a new sea ice service reporting on the Baltic Sea landfast ice thickness and extent. The service will be utilized by governmental and local authorities, as well as the general public for recreational activities. The Baltic Sea is partly covered by ice every winter, with landfast ice occurring along the coasts of Finland, Sweden, Estonia and Russia. During severe winters, it can even form in the Southern Baltic Sea along the Danish straits. 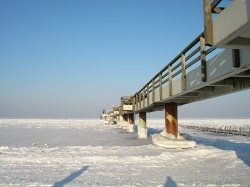 FMI’s new Baltic Sea landfast ice extent and thickness (BALFI) service provides information on the landfast ice extent and thickness, snow thickness, and deformation of landfast ice. Possible applications for the new BALFI service include reports ahead of recreational activities such as skiing, snowmobiling and ice fishing, as well as assisting icebreakers, ferries and search and rescue operations. The landfast ice charts are produced daily during the ice season which typically begins in November-December and ends in May. The charts are updated using new Sentinel-1 satellite imagery.